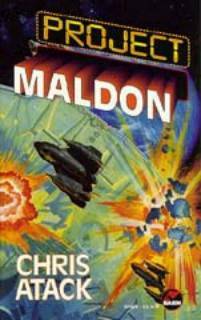 Chris Atack's Project Maldon, is a surprisingly good read. Indeed, I was so surprised that I decided to go to the trouble of actually writing a review. I hope to convince you to rush out and buy a copy of this debute novel, in spite of the apparently good reasons not to. I admit I really wanted to put the book back. The cover art -- two poorly drawn stealth bombers apparently attacking a space station, complete with firery explosions -- is not what you would call promising. The artwork is also, as it turns out, completely irrelevant: there aren't any space battles in the book. (Okay; there is a rather tense board meeting in Earth orbit, but I don't think that counts.) Worse even than the artwork is the typography: "Project Maldon" juts out of the cover like some cheezie movie marque. Even the author's name works against him, summoning up visions of glorified violence and hacknyed mayhem. This is not, I am sorry to say, a cover that would draw a second glance from even the most fanatical devotee of milateristic space opera. But never one to judge a book by its cover, I turned to the blurb. Where it appears that Project Maldon is yet another redundant entry in the seemingly endless procession of cyberpunk cash-ins: the dystopian future; the god-like AI, the slow slide towards Armageddon. Gibson's once-original vision has been rehashed by so many talentless hacks, that I swear I'll give up sf if I have to read one more of these annoyingly predictable, formulaic, mass market, processed cheese substitutes. Cyberpunk is an idea whose time has past, okay folks? I mean I teach in a town where half the population still thinks that giving women the vote was a bad idea, and yet even my most isolated rural students routinely debate the finer details of artificial intelligence on their web pages. I'm telling you, this isn't sf any longer, it now belongs to the genre of "bad mainstream bestsellers". I fully expect the next cyberpunk offering to be by Danielle Steele. Front cover art and back cover blurb notwithstanding, however, this first novel is well worth your attention. Atack's strong narrative skills and engaging style elevate Project Maldon above the run of the cyber-mill, and the familiarity of the Canadian locales and future history added to my enjoyment. (That the story is told from the perspective of a dashing sociologist didn't exactly hurt either. I haven't enjoyed a sociologist as protagonist this much since Chad C. Mulligan in Brunner's Stand On Zanzbar.) Drawn into the action, I found myself reluctant to put the book down again, even though much of it is Canadianly-depressing. Atack is clearly carrying on a long tradition of Canadian sf. There is no happy ending, for example, no American-style saved-by-the-calvalry rescue. Almost everybody we care about gets killed, the good guys lose, and our protagonists fails to achieve his major goals. In the end, this turns out not to matter terribly, because most of the battles he has been fighting were the wrong ones anyway. The ending is typically Canadian in its ambiguity: our side didn't win, but neither did the bad guys. Are things better or worse than when the book started? We can't tell, and won't know until history passes judgement years later, though it is already clear that almost no one got what they thought they wanted. Atack's future is depressingly familiar and believable, though the strong narrative carries us past the bleak cityscapes at a sufficiently page-turning pace that you'll be hooked anyway. Unlike many books set in the near future, Atack resists the temptation of spelling out the details of that future history. None of Atack's characters can really understand how the country came to be in such a terrible mess, which is both more believable and more emotionally satisfying for the reader than any pat explanation would be. As a sociologist, I almost always find authors' predictions to be annoyingly niave, but Atack simply avoids the whole issue by sticking to nicely vague allusions, and the occasional cliched encyclopedia entry. I also really appreciated that Atack left much of the old world quietly in place, untouched by the developments around them. The protagonist's office is next door to a soap factory, for example, which continues to pump out detergent pretty much as it always has, even while everything else around it is going to hell. There are a lot of such nice touches in this book. Although admittedly a novel in the cyberpunk tradition, it is sufficiently original to warrant attention, particularly given that it is Atack's first time out. Project Maldon is easily comparable to Robert Sawyer's first novel, Golden Fleece, and might even be the best first since Sean Stewart's Passion Play. Atack is, therefore, clearly worth watching. Originally published in Under the Ozone Hole.